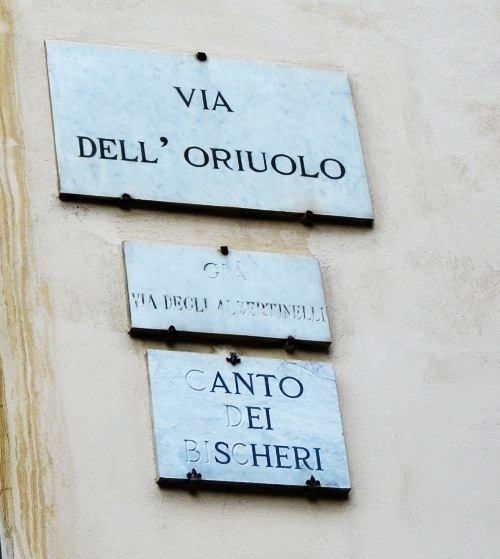 Canto de’Bischeri, Florence (Fig.Bischeri; Fig.Bischeri marker). Record of payment for this temporary arch by Rosso is contained in Florence, State Archives, Otto di Pratica. Deliberazioni e partiti, condotte e stanziamenti, 11, fol. 89v-94r. The information that is available on Rosso’s arch makes possible only a partial glimpse of what Rosso’s work was like. It was located where both the Via dell’Oriuolo and the Via del Proconsolo enter the Piazza del Duomo,9 and was so placed that the axes of the two streets crossed at the center of the arch. This siting can be gathered from Landucci’s description. It was of enormous size, rising as high as the tops of the houses nearby, probably to accommodate the procession to pass through it. Its four sides would have had Doric pilasters supporting a cornice, and at least one pediment, and the entire arch was painted in imitation of porphyry and was partially gilt. Landucci specified twenty-seven pilasters, but given the need to dispose of these evenly on the four sides of the arch, this number is improbable. A likely arrangement on the outside would have been pilasters at the corners, and one on each side of the four arches, making four pilasters on each side and hence a total of sixteen. There must, however, have been more, perhaps on a second level or on the insides of the arches, if Landucci’s number is to be considered as approaching some kind of true approximation. In whatever number and arrangement, each side would most probably have had an even number of pilasters. The gilt ornament mentioned by Landucci included swags of pomegranates and pine cones hanging down from the middle of the pilasters. Above the piers would most probably have been set the narrative scenes – Shadrach and His Companions Meshach and Abednago in the Fiery Furnace and Moses and Aaron Turning the Waters of the Nile into Blood – and perhaps below them individual figures or groups – Elisha Curing Naaman’s Leprosy and Jacob and the Angel – the former reliefs, the latter statues in niches made out of painted cloth, as suggested by Cambi.10 Noah Inside the Ark Awaiting the Return of the Dove would seem to have appeared as a relief on the other side of the arch. If there were only the narrative scenes and groups indicated by de’Nobili this may have been because the arch was not finished, for what he mentioned could not possibly have completely decorated this large arch. Perhaps only one side of the arch contained the statues and reliefs, the side facing the Via del Proconsolo from which direction the procession arrived, in spite of de’Nobili’s reference to another side (banda), which could be simply the other side of the same face. However, de’Nobili’s account could itself be incomplete. On the top of the arch was the sculptured group of Abraham and Isaac, probably also facing the Via del Proconsolo. The inscription given by Panciatichi would most likely have been on the entablature or on a plaque facing in the same direction, or repeated on all four sides. 1 The document was transcribed by Gino Corti. It is fully published by Minucci del Rosso, 1879, 481-482, and by Ciseri, 1990, 272, Doc. XXXVII; partially in Pagnotta, 1987, 244, Doc. 12; and mentioned in Vasari-Milanesi, V, 25, n. 3. It is slightly differently transcribed in Von Holst, 1974, 216-217, Doc. 39; see also Von Holst’s Docs. 37-38 for Granacci’s participation in the decorations for this entry. Franklin, 1994, 297, Appendix A, DOCUMENT 8, transcribed the part of this document that pertains to Rosso, commenting that the 480 florins must have included materials. Waldman, Louis A., Baccio Bandinelli and Art of the Medici Court: A Corpus of Early Modern Sources, Philadelphia, Memoirs of the American Philosophical Society, Vol. 251, 40, no. 85, fully transcribed with notes but none relating to Rosso. 2 Vasari’s statement is mentioned in Venturi, IX, 5, 1932, 194. The entire entry is discussed in Shearman, 1975, and mentioned in Shearman, 1980, 9; the bibliography on it is given in Mitchell, Bonner, Italian Civic Pageantry in the High Renaissance. A Descriptive Bibliography of Triumphal Entries and Selected Other Festivals for State Occasions (Biblioteca di bibliografia italiana, LXXXIX), Florence, 1979, 39-43, no. III. Mentioned also in Bonner, 1986, 12, 37, 107-108, and in Carroll, 1987, 16, 33, n. 28. The entire entry is also discussed in Testaverde Matteini, 1988, 334-340, with a map giving the location of Rosso’s arch, which otherwise is only briefly considered, and in Ciseri, 1990, with complete documentation and maps; see also Cummings, 1992, 67-82. 3 See also Shearman, 1975, 146, and Ciseri, 1990, 173, Doc. I. 4 A full copy of the now incomplete Sienese manuscript is in Florence, Bibl. Marucelliana, MS. C. 26, with the passage on Rosso’s arch on 304-305. This accurate copy is the source of Luca Landucci, 1883, 355-356, containing the description of Rosso’s arch, with the orthography changed and the word “tutte” toward the end missing. See also A Florentine Diary from 1450 to 1516, translated from the I. del Badia edition by Alice de Rosen Jerris, London and New York, 1927, 282; and Ciseri, 1990, 195, Doc. IX. 5 See also Shearman, 1975, 136, n. 2, no. 7, 146, n. 32; and Ciseri, 1990, 179, Doc. IV. 6 See also Shearman, 1975, 136, n. 2, no. 2, 146-147, n. 32; and Ciseri, 1990, 224-225, Doc. XIV. 7 Bartolomeo Masi, Ricordanze di Bartolomeo Masi, calderaio fiorentino, dal 1478 al 1536, ed. O. Corazzini, 1906; passage here taken from Ciseri, 1990, 203, Doc. XI. 8 See also Shearman, 1975, 136-137, n. 2, no. 16, 146-147, n. 32; and Ciseri, 1990, 306-308, Doc. XLV. The arch is discussed by Franklin, 1994, 3, 13, 29, 30, 265, 297, who thought the rare Old Testament subjects and the use of canvas bring to mind his later Moses [P.14] and that the project was related to Rosso’s decorations of the Gallery of Francis I at Fontainebleau. Mention of the arch also appears in Ciardi, 1994, 18, 22, 90, n. 20, 91, n. 44, 92, n. 53. 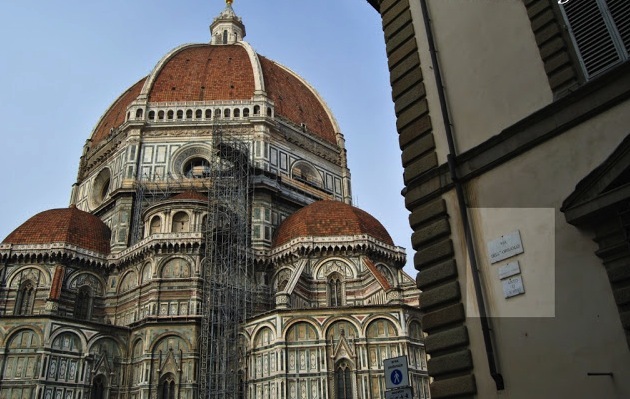 9 On this location, see Ugo Procacci, “L’uso dei documenti…,” Donatello e il suo tempo, Florence, 1968, repeated in H.M. Caplow, “Sculptors’ Partnerships in Michelozzo’s Florence,” Studies in the Renaissance, XXI, 1974, 157; see also Pirro Giacchi, Dizionario del vernacolo fiorentino, Florence, Bencini, 1878 (reprint, Rome, 1966), 22-23, under “Bischero!”. 10 Shearman, 1975, 146, n. 32, rightly suggested that Cambi’s short description could be interpreted as indicating that there were both single figures and narrative scenes. Shearman, 1975, 147, n. 34, interpreted payments to Giuliano Bugiardini and Piero di Cosimo (see Minucci del Rosso in n. 1) as perhaps for costumes for real persons that may have been on some of the arches of this entrata, but no such figures are actually mentioned in the various descriptions that are known. The wording of the record of payment could indicate attendant figures, some who sang, who were associated with the themes of the arches but were not actually part of their compositions. 11 See Landucci, 1883, 279, and Agostino Lapini, Diario Fiorentino dal 252 al 1596, ed. G.O. Corazzini, Florence, 1900, 90, under entries of this date indicating that the pope would visit Florence, but expressing no knowledge of a proposed entrata, as indicated by Shearman, 1975, 149, n. 39. 12 See Shearman, 1975, 139-140, with the suggestion that the program may have been devised by Jacopo Nardi; Ciseri, 1990, 106-110, also suggested Marcella Virgilio Adriani.